Our tax system is complicated. It is difficult for many adults to understand. Now try explaining to your kids what a tax is, how to budget for it, or how to submit all the right paperwork to get a refund or pay in. 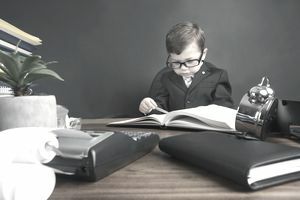 In this article, we are going to break it out into four steps that you can use to teach your kids about taxes. The first thing you should do is discuss with your child what exactly taxes are and their use. In general the younger they are, the simpler you should keep the details. Thus with a child below high school, the conversation could be as simple as taxes are what you pay into the government to help pay for services for the entire country, state or town. The older they become, the more you can add in examples of what the money may go for such as roads, schools, and the military. You can also introduce other types of taxes such as sales tax and property tax. The next step would be to start introducing them to the concept by taking taxes out of their allowances. It is a great way to have them understand that when they hit the "real world" that they will not get the full amount of their salary or hourly wage. Instead, a percentage will go to the government. You get to play the role of government here, so you should set out specifically what that money will go for, so they understand the role of taxes. You could use things like paying utilities, toilet paper purchases or car maintenance. The goal is to pick something that costs money and is used for the good of everyone in the house. The older your child becomes you will want to have them learn how to budget with taxes in mind. If your child has a job, they can begin to learn how to budget and this can be planned as an expense. If they don't have a job, but you are practicing with their allowance like we discussed above, then you can also begin to have them build it into a budget, but try and keep it simple with just one line item. The younger your child is, the harder this one becomes to manage, without them becoming confused in the process. So I would try to save it this step for the kids that are sixth grade and higher. Finally, once your children do get a job, if they make enough and have taxes taken out, they will want to file a tax return. It is the point where you get to explain the process of getting your W2, filing the right paperwork and submitting it to the government. You can use this time to review how taxes are calculated and get into more of the details such as deductions. It is where it can get confusing, so try and ease into what you are teaching. Maybe you add a few more concepts each year, or once they fill out their first return, you can then review more once a quarter to keep it fresh in their mind. Need more help with explaining the tax basics? By helping your child understand taxes early on, they won't get the surprise of their life when they open up their first paycheck.